Vietwater’18 was held in Ho Chi Minh (HCM) City on 5–9 November, returning as one Vietnam’s largest water technology and innovation conferences. The Australian Water Partnership (AWP) supported the Australian Water Association (AWA) to deliver a series of activities during the event, which contributed to strengthening partnerships between Australia and Vietnam and furthering the current programs AWP is supporting in Vietnam. 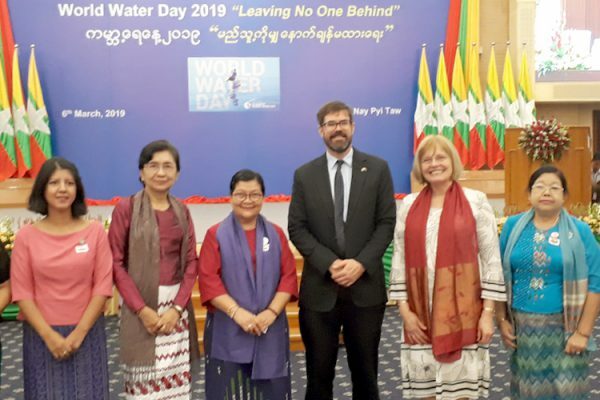 Part of the Australian Government and AWA program to connect the Australian and Vietnamese water sectors, this year’s event attracted the largest Australian water delegation so far with over 100 delegates. The delegation included representatives from the Victoria State Government and water utilities, and was led by Australian Ambassador to Vietnam Craig Chittick, Australian Consul-General in HCM Karen Lanyon, NSW Regional Water Minister Hon Niall Blair, Commissioner for Victoria to SE Asia Brett Stevens, AWP Partnerships & Knowledge Manager Marian Neal, and ANZ Vietnam CEO Jodi West. AWP’s involvement included a strong presence at the Australian Pavilion – a central point for Australian organisations to promote their services and wares in the Vietwater Exhibition, which attracts over 15,000 delegates and includes a series of workshops, business matching, site tours and networking events designed to facilitate strengthened partnerships. “AWP was pleased to once again join the Australian Water Pavilion at Vietwater to showcase Australian capabilities, technical knowledge and innovations,” said Dr Neal. AWP supported a Cambodia-Australia Collaboration workshop and networking lunch, facilitated by AWA and focusing on Technology Innovation and Entrepreneurship in Water. The event provided a platform to build awareness of water supply development in Cambodia, and to explore and establish linkages between Cambodian and Australian water industry representatives. Workshop attendees also included Palladium, the Department of Foreign Affairs and Trade, Austrade, and Australian technology companies. The Vietnam-Australia Water Utility Improvement Program was also highlighted through a workshop and panel session facilitated by AWA and the Vietnam Water Supply and Sewerage Association. Water utility professionals involved in the program shared their achievements and outcomes, and an interactive discussion between all session attendees explored lessons learnt from the program and effective tools and approaches to improve water utility performance. AWP also presented in a workshop on Gender Equality in the Water Sector, sharing its strategy for Gender Equality and Social Inclusion (GESI) with workshop participants, as well as next steps and opportunities to get involved in the Australia-Vietnam Women of Water activities. The workshop – linked to the AWA’s Channeling Change Program – was conceived to enhance Vietnamese women’s voices in decision-making and leadership, promote women’s economic empowerment in the water sector, and facilitate mentoring, support networks and skills development for female entrepreneurs and their increased engagement in business in the Vietnamese water sector. Over 100 male and female participants attended. The full Australian program at Vietwater’18 won the “Best at Show” award for the 4th year running and was well received by delegates including Australian dignitaries.